There are a number of ways to support those affected by cancer through the Connecticut Cancer Foundation. Whether helping to fund research, sponsor an event, or donating in honor of or in memory of a loved one, each donation helps sustain our mission. 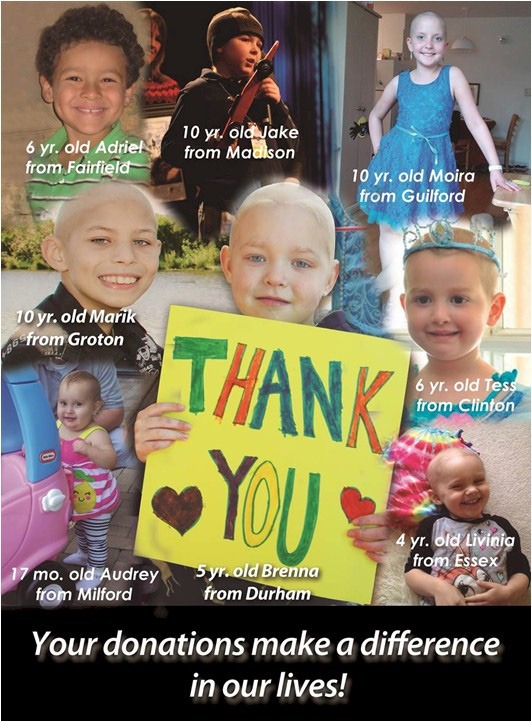 More than 85 cents of every dollar spent by CCF goes directly towards assisting CT cancer patients and research. Support cancer patients today. Many cancer patients and their families are suddenly confronted with insurmountable bills at a time when focusing on healing is critical to their recovery. A charitable gift of financial support to cancer patients and their families can quickly and compassionately remove some of the stress and worry to help patients fight back against their illness. Double the impact of your donation. Please check with your company; many companies offer a matching gift program. Organizations have different requirements and procedures. Email to learn more. Make a donation in memory of a loved one or to celebrate a loved one’s survivorship, a special occasion or simply to recognize their courage in fighting cancer. When an ‘In Memory’ gift is received, we promptly send a personalized tribute card to the person or family indicated, notifying them of your thoughtful donation but not revealing the amount. 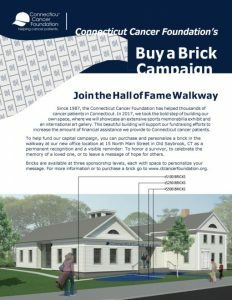 Buy A Brick on our Walk of Fame in honor of, or in memory of, someone you know who has fought cancer. CCF’s research funding focuses on an organization we have funded since its inception in 2010 – the International Lymphoma Radiation Oncology Group (ILROG). ILROG is a worldwide forum to further the understanding of radiotherapy in the treatment of lymphoma in children and adults around the globe. The organization is led by Dr. Joachim Yahalom of Memorial Sloan Kettering, the physician who saved CCF’s Founder, John Ellis’ life more than 30 years age. Fund cancer research by making a restricted donation to CCF to support Dr. Yahalom’s lymphoma research or the other types of cancer research funded by CCF. Funding toward cancer research is welcomed at all levels. Contact for more information. You can support CCF in a variety of ways, including by becoming a major sponsor at one of our events throughout the year. Sponsor a table at our annual dinner, or one of our many fundraising events throughout the state. Celebrity Dinners bring together guests, sports stars and sponsors to support the Foundation’s efforts to raise funds for CT cancer patients and their families and fund cancer research. Sponsor a table at the dinner and have the chance to meet some of Major League Baseball’s superstars of the past and present. Become a sponsor at one of our many fundraising events throughout the state. We need sponsors for Cycle Against Cancer events statewide, the Melt-a-thon event and more. Or you can become a major sponsor and recieve recognition at all the annual CCF events. Event sponsorships are available at all levels to show your charitable spirit. There is great potential for many individuals to achieve their philanthropic goals and create a lasting legacy using gifts of art work. CCF accepts gifts of art and will work with your family, legal and financial advisors to ensure that all parties understand and participate in the process. Artworks will be displayed in our Art Gallery space and/or sold to fund CCF’s mission of helping cancer patients.